It doesn’t take much for a young ballplayer to lose his prospect status. One injury. One bad year. Baseball is a cruel game, all too eager to make future stars into screaming failures. When a player falls from mega-prospect all the way to spring training non-roster invitee, it’s impossible not to root for a comeback. This spring, that player is Brandon Wood. In the two Rockies games I’ve seen in Arizona so far, Wood has gone 5-for-5 with two singles, a double, and two triples. On Saturday in Surprise, Wood was a home run away from the cycle before manager Jim Tracy yanked him from the game. After Wood opened Monday’s game with a sharp single and a ringing triple to right-center, Tracy again pulled him from the lineup. Because Jim Tracy is the Grinch. Tracy’s crowd-disappointing (if understandable) lineup management notwithstanding, the Rockies have high hopes for Wood. Given the spring training hero’s tumultuous career path, that’s saying a lot. A first-round pick of the Angels in 2003, Wood advanced to Rancho Cucamonga of the California League two years later. And he went bonkers. In 130 games, Wood hit .321/.383/.672. He clubbed 43 homers, 51 doubles, and four triples, knocking in 115 runs. He did all this while playing shortstop. The Cal League is a great circuit for hitters. But Cucamonga isn’t anywhere near the hitter’s haven that High Desert, Lancaster, and other homer-happy stadiums are in that league. You could temper Wood’s numbers. But you couldn’t just wave away 98 extra-base hits from a 20-year-old shortstop in High-A ball. The following offseason, Baseball America rocketed Wood to no. 3 on their top 100 prospects list. but also hit below the Mendoza Line, as hitters with 55-to-4 strikeout-to-walk rates tend to do. The pattern kept repeating itself. Wood whacked 54 extra-base hits in 99 games with a .910 at Salt Lake in 2009, got another cup of coffee with the Angels, and stunk again. Injuries and roster turnover gave Wood a golden opportunity for a full-time big league job in 2010. He rewarded the Angels by hitting .146/.174/.208, crummy offensive numbers for many pitchers, let alone the former no. 3 prospect in baseball. 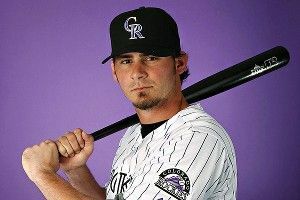 After a brief and brutal start to the 2011 season, the Angels cut Wood loose, and the Pirates quickly snatched him up. Once again, he crapped out, hitting .220/.277/.347 over 99 games, somehow failing to stick on a Swiss cheese team that lost 90 games. When the Rockies signed Wood to a minor league deal in November, they had a plan. This spring, Wood has raked. His two hits Monday hiked his line to .438/.438/.813. Granted, this was over 16 at-bats. Granted, we’ve seen this kind of spring training display before from Brandon Wood. But you know what? Crazier things have happened. The Rockies dumped Ian Stewart this offseason. Casey Blake is no. 1 on the team’s depth chart at third base; he’s also 38 years old, injury-prone (just 63 games played last year), and likely not much of a threat at this stage of his career. Colorado’s other alternatives include another prospect-gone-sour in Chris Nelson, light-hitting Jordan Pacheco, lighter-hitting Jon Herrera, and not-yet-ready prospect Nolan Arenado. Meanwhile, Wood enters what could be his offensive prime at age 27, with a better pedigree than all his third-base rivals combined and an incredibly short burst of success that I’ve decided to wildly overrate. I’m officially putting in a request to embed me on the Brandon Wood beat, if only to see if he can keep his 1.000 batting average alive. And tongue-in-cheek jousts at Tracy aside, there’s always a chance that someone like Wood could be a late-bloomer, that the thin air at Coors Field could be a boon for his all-or-nothing skill set, and that he could actually, maybe, possibly win the starting job on merit. The Rockies have two stars in Troy Tulowitzki and Carlos Gonzalez, but also a lot of question marks on the roster, in an NL West that’s very much up for grabs. Any rational analyst would tell you that 16 at-bats against uneven competition, in exhibition games, in desert air, mean nothing. But the Rockies think something else might be going on here, something that allows you to look past all the ifs and buts surrounding Wood’s small-sample success, even if only for a minute.